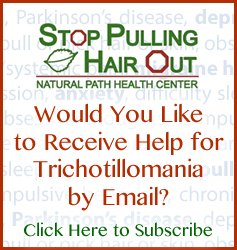 We work with a lot of people with trichotillomania. A good number of them are children, so we are usually talking with one or both parents along with the child during our consultations. More often than not, we spend a lot more time speaking with mom throughout the process as we work to rebalance the underlying cause(s) leading to their child’s urges to pull or pick. We are obviously focused on helping their child eliminate the urge to pull/pick, but the parents of children with trichotillomania need support too. Parents often don’t realize the toll it takes on their physical and mental health of having a child with trich. We often hear about the helplessness, frustration, guilt, anger, disappointment, despair and/or exhaustion that parents experience as they struggle with not only trying to help their child cope with this disorder, but trying to come to grips with it themselves. Even though it can sometimes feel like a long and lonely road, help can be found along the way. One option is to try one-on-one therapy, preferably with a therapist or counselor that works with kids with trichotillomania. These people are uniquely qualified to not only help a parent work through their own feelings and thoughts, they can also provide unique insights into what the child may be experiencing and provide ideas on ways to support them. Another option is online or face-to-face support groups. Online groups far outnumber local support groups, but both are out there. The Trichotillomania Learning Center has a couple resources that may be valuable. To try and find a local support group, visit: http://trich.org/treatment/support-groups.html; to look for an online option try: http://www.trich.org/treatment/resources-online.html. Another option for online support includes: http://health.groups.yahoo.com/group/ParentsTrichSupport/. It is important that parents find and get the support they need. None of us is naturally equipped to deal with everything life throws at us. Having a child with trichotillomania is one of those life experiences that is often dealt with best with the support of those that have the experience to provide ideas and possible solutions so parents don’t have to feel like they have to do it all on their own. I have a child who is now 21 and lives with us still. She suffers with trich, depression, anxiety and has an eating disorder. I’ve reached my limit. I’ve hit a wall. Thanks for reaching out; it can be incredibly trying – for you, your family and your daughter – to try and cope with the so many seemingly different health conditions. We may be able to help; all of the conditions listed above – trich, depression, anxiety and eating disorders – likely have a similar root cause. That cause is neurotransmitter dysfunction. The good news is that we an likely elicit change in most or all of these conditions by supplying your daughter the right balance of amino acids and supporting nutrients; the bad news is that it may take 3-6 months to get the balance right. To learn more, please visit http://www.amino-acid-therapy.com; if you’d like to get started, please have your daughter contact us.